Hi there! Hope everyone is doing well today. Thought I would post a digital collage that is in stark contrast to the one posted yesterday. I have used this one to create the header on my other blog, Original Art Studio. 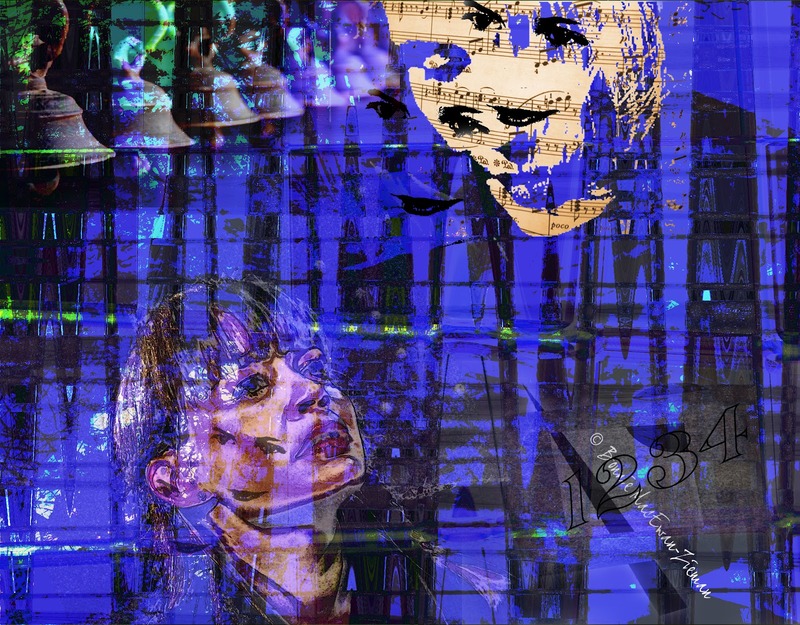 As I gaze at this digital collage now I see female faces from the web, bells from the web, a photo of one of my old paper collages, and a threshold image scattered here and there of my grandaughter. Oh, just spotted some bars of music also procured from the web. All these elements were applied to one of my high resolution backgrounds. The unfortunate thing is that because I have used low resolution images gathered from the web on this piece - it will not print well. If you are making a digital collage that you want to print on canvas or as a poster, card, calendar, etc., make sure all the elements you use are high resolution (e.g. 300 pixels per inch). Then you will really have a print-worthy piece. This kind of work exists for me to admire, not to emulate. such an exciting work of art Bonnie!